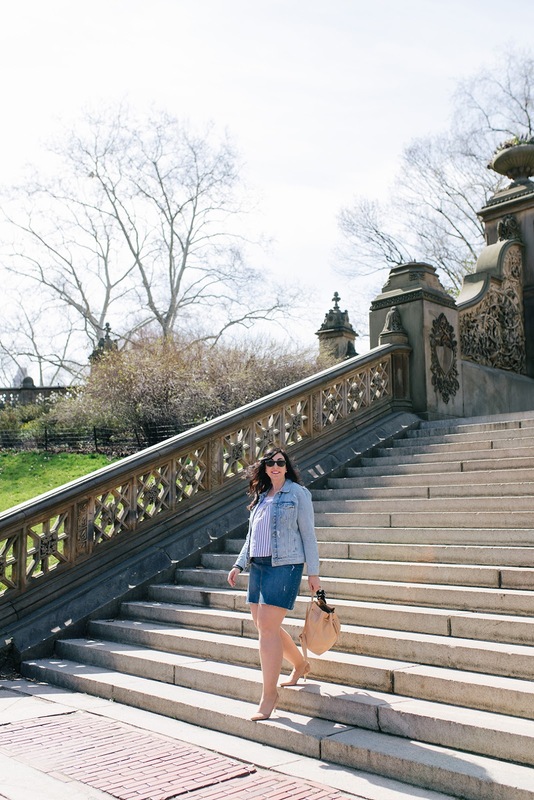 This Madewell Spring 2018 OOTD outfit post about butterflies and cherry blossoms is sponsored by Madewell. Although some of the clothing I’m wearing was provided by Madewell, all opinions are as always my own! Please read this blog’s disclosure post for more info. I’m missing the cherry blossoms already! This year’s bloom was particularly spectacular in Brooklyn and Manhattan, with a long Winter yielded peacefully to a burst of blooms in pink and white. I took advantage of the blossoms to shoot this work-ready outfit with Madewell. As you know I’m a huge Madewell fan! This Madewell Spring 2018 OOTD is all about making a casual piece work-ready. Often I’ll get a reader asking how to make Madewell’s casual chic pieces work-ready, and usually my answer is: layering! A cardigan, a blazer, or as in this case, a denim jacket can elevate a casual item to workwear apparel. 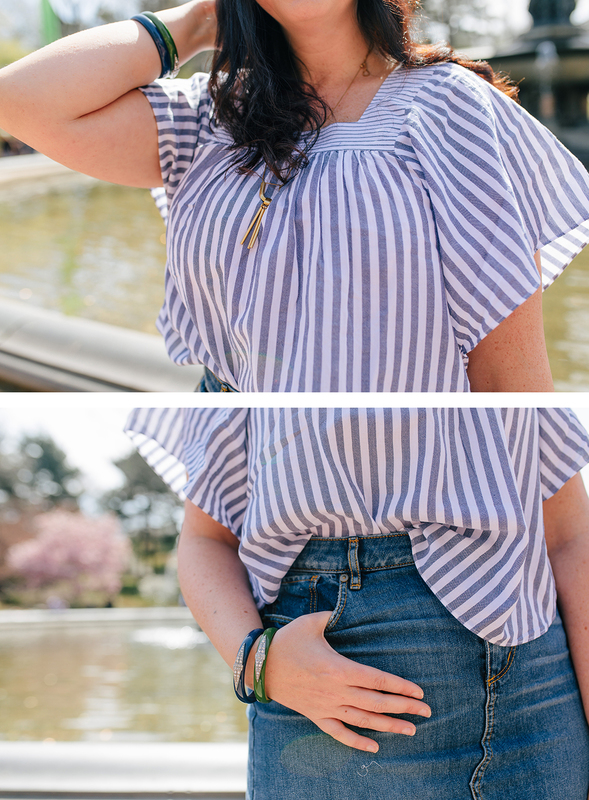 I love how the stripes of the butterfly-sleeve top work with a couple of denim items. 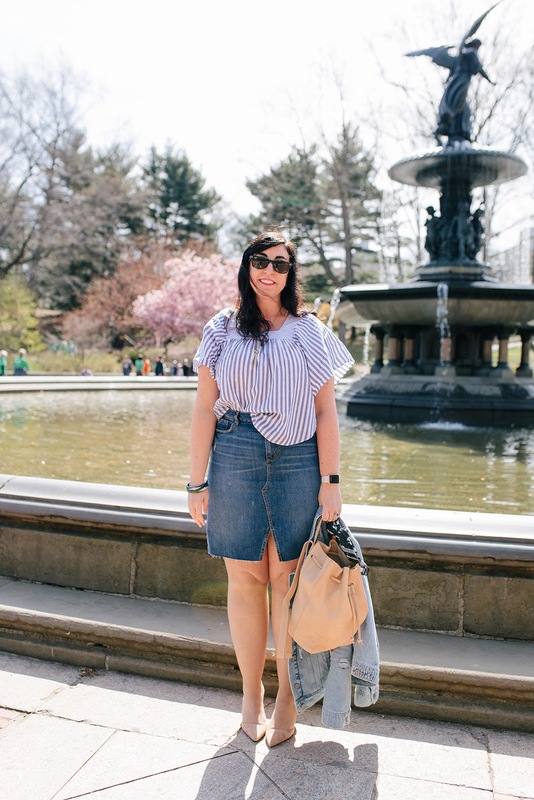 I always enjoy working with Madewell on outfits because I have endless pieces from them in my closet. My most recent additions include the Ace & Jig Dusty Dress ($365), the Perfect Summer Jean in Fitzgerald Wash ($98 and spectacular on curves!) and a new color of both these sunglasses and this bandana, which I often tie around my bag straps as seen in this look. Next up for me? Probably the entire look shown here. 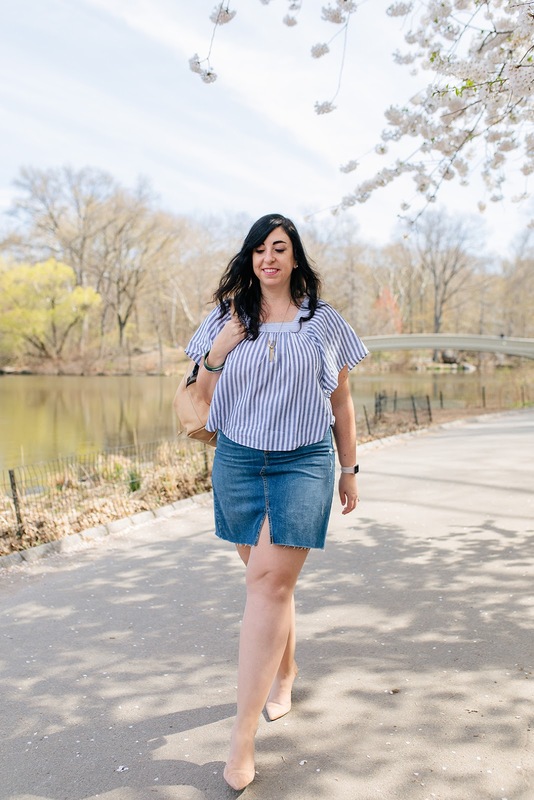 This Madewell Spring 2018 OOTD easily takes me from work to weekend. In case you missed it, there’s a new Madewell perk today and I selected more of my favorite June 2018 Madewell pieces here. Ahh Madewell. How I adore you! Previous Post Peek at the Madewell Insiders June 2018 Perk! Wow😍u look so stylish Roxy!!!! Lovely shots…. Thank you so much Nam!! The fit and style of this top is perfect for warm summer days! Madewell is seriously the best! Loving this outfit! They really have shot to the top of my favorite brands list! So cute! I miss the Cherry Blossoms too. So beautiful. But even more excited for summertime sunshine! So true, I look forward to the ocean getting just a drop water for Summer dips! It's still pretty chilly here and in the Hamptons. you look great!! <3 Lovely pictures. Thank you so much Magnolia! You can't go wrong with a blue and white striped shirt and that bucket bag is adorable! Such pretty pictures with the cherry blossoms. This outfit is so cute!!! I am loving the denim skirt, so perfect for Summer! Agreed, I love this skirt and the slit which gives it a modern edge. Thank you very much Leandra! Love the outfit (and the shoes which are one of JCrew's best). I have my basket at madewell ready to go waiting for one sold out item to pop back. I have purchased a good deal at madewell (and oddly Zara) this year. Zara is always on my radar. I didn't buy much there over the Winter because I didn't connect with their stuff, but they always have cute Summer items!! Thank you so much Eina!! Perfect outfit for this weather, I love the top! 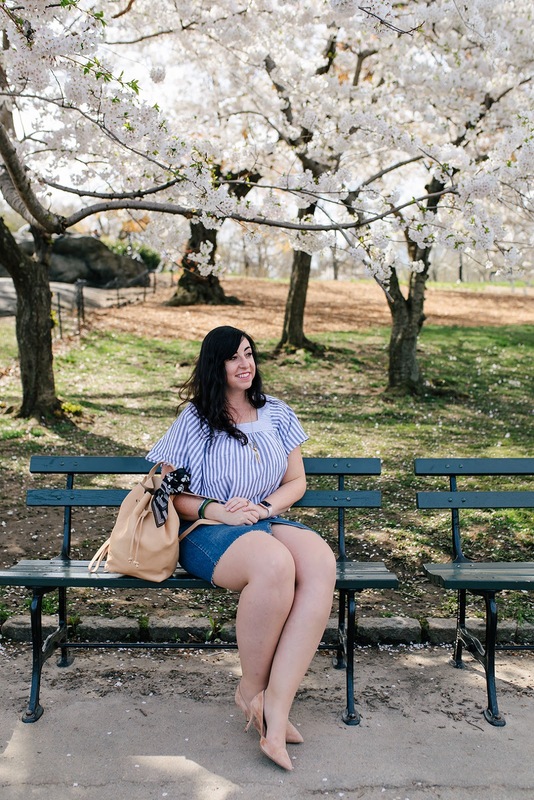 These photos are so pretty and the location makes me wish spring lasted longer in my city! It's the same here, blink and Spring is gone to Summer! I do love these magical few weeks. Thank you so much thejasminemaria! Love that denim skirt! So classic! Agreed, can't go wrong with a good denim skirt! Such a cute outfit! I absolutely adore Madewell. And these photos are making me miss NYC 🙁 It's still so weird that its not home anymore! Oh man I know that feeling! I miss Colorado now that I don't live there anymore, but when I was in Colorado I missed NYC so much. Madewell is one of my favorite clothing stores! Your pieces look so chic and timeless. I need to add that skirt to my wishlist! Thank you so much Candace! Highly recommend the skirt, and it's an extra 40% off today too!